Thanks to Engr. Elbert M. Malonzo, RHCT for this beautiful picture. Perfect catch!!! Mine's up hope you can drop by... Happy WW! that's a clear, beautiful picture! very nice colors. good job! My wordless is posted. There is a direct link at the top of my blog post that will take you to my wordless photo if you'd like to skip the test I provided above it. Happy Wednesday. Super job! Pass on my compliments. Wow, beautiful shot. Happy WW. 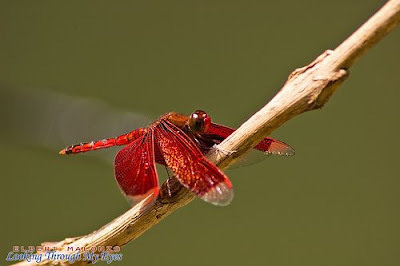 That's a beautiful red dragonfly that you've captured! Awesome!